Folding equipment handle. 4-3/8" long arm with 5/16" hole at end. Arm pivots 1-1/8" away from panel to 90º, 180º or 270º angle. Spring loaded lock / release button. 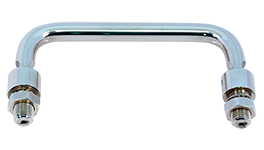 Mounting end has 10-32 steel insert in the solid aluminum body, 5/8" x 7/8". Just add your own 5/16" rod of any length to a pair of these and you have a custom tilting handle. Hole to pin rod already drilled. Made of black anodized aluminum. Hundreds of pounds weight capacity. Aircraft (Collins) quality!! Sold in pairs. Hammond Manufacturing folding handle. Does not include aluminum extrusion. See PDF. AJAX drawer handle. White paint on cast. ZAMAK. 3" mounting centers. 3-3/4" x 7/16"W x 3/4"H.
Vintage handle. Black vinyl, brass color hardware. Cone shaped standoffs. 90º mount. 8-1/8" overall length, 1-5/8" high. 7-1/2" c-c threaded mount holes. Vintage handle. Black vinyl, chrome trim. Cone shaped standoffs. 90º mount. 7-3/4" overall length, 1-5/8" high. 7-1/8" c-c (10-32) threaded mount holes. New, unused from the 1960's. Very, very nice!! Vintage handle. Black vinyl, chrome hardware. Cone shaped standoffs. 45º mount. 7-13/16" overall length, 1-5/8" high. 7" c-c threaded mounting holes. Vintage handle. Black vinyl, chrome hardware. Cone shaped standoffs. 45º angle mount. 11-1/4" overall length, 1-5/16" high. 10-5/8" c-c threaded mounting holes. Vintage handle. Black vinyl, chrome hardware. Triangle shaped standoffs. 7-1/2" overall length, 1-3/4" high. 7-1/16" c-c threaded mounting holes. Vintage handle. Brown wood grain vinyl, chrome hardware. Cone shaped standoffs. 45º angle mount. 7-13/16" overall length, 1-5/8" high. 7" c-c threaded mounting holes. 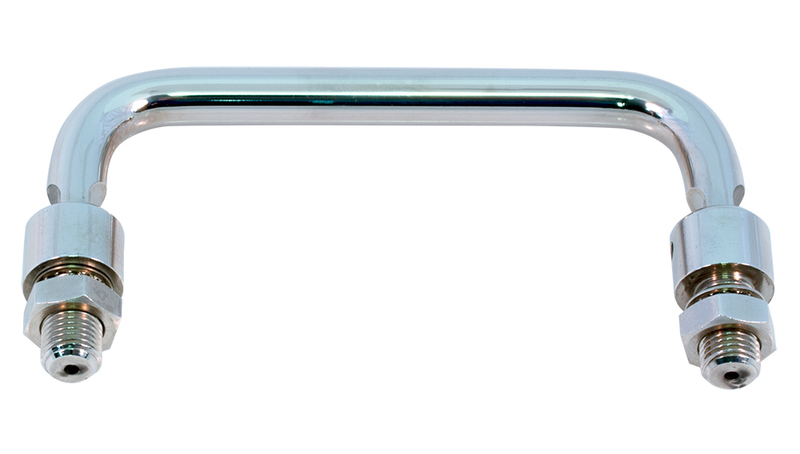 Unicorp aluminum equipment handle. Black, round. 3/8" diameter. 1-1/2"H. 4-1/2" c-c mounting. Mfg. P/N: A7784-4. SRS P/N: MP0006. Aluminum equipment handle. Black, oval. 0.635" wide, 1.5" high. 4.5" c-c mounting. SRS P/N: MP0011. Aluminum equipment handle. Black, oval. 0.375" wide, 1-3/8" high. 2" c-c mounting. SRS P/N: MP0015. Aluminum equipment handle. Brushed aluminum. 3/8" square posts. 1-1/4" high. 3-1/4" c-c mounting holes. SRS P/N: MP0009-01. Elegant Cambion 6" wide, 1-1/2" deep equipment drawer pull. Threaded ends for easy installation. Brushed aluminum. 5-1/2" wide, 1-3/4" deep. Threaded ends for easy installation. Black anodized finish. Keystone Electronics Corp. instrumentation handle. Brass: ASTM-B16 - black. 1-1/4" c-c mounting x 1" deep. 4 - 40 thread. 0.156" diameter. 50,000 available. Wire ladder chromed handle / pull. 1.68" x 1.02" x 3/16"D. Threaded 6-32, 1.5" c-c. Gates P/N: 448-0538. Amatom 5/16" round handle. Nickel plated brass. 1-1/2"H x 3"L. 10-32 thread. 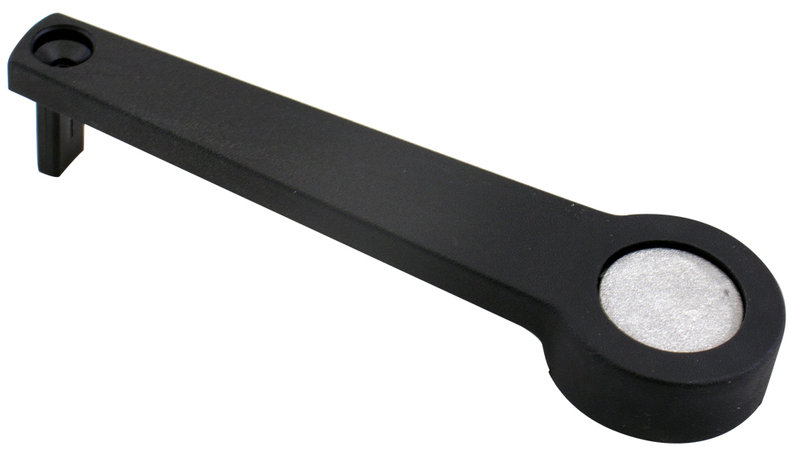 Cambion folding handle. 4-1/2" c-c. 1-3/4" high. 3/8" mounting threads. Chrome fasteners (only) for strap handle.